We have put together a list of problems commonly faced by parents. We hope these tips will be useful for you in guiding your young ones to be astute and discerning participants in the digital world. 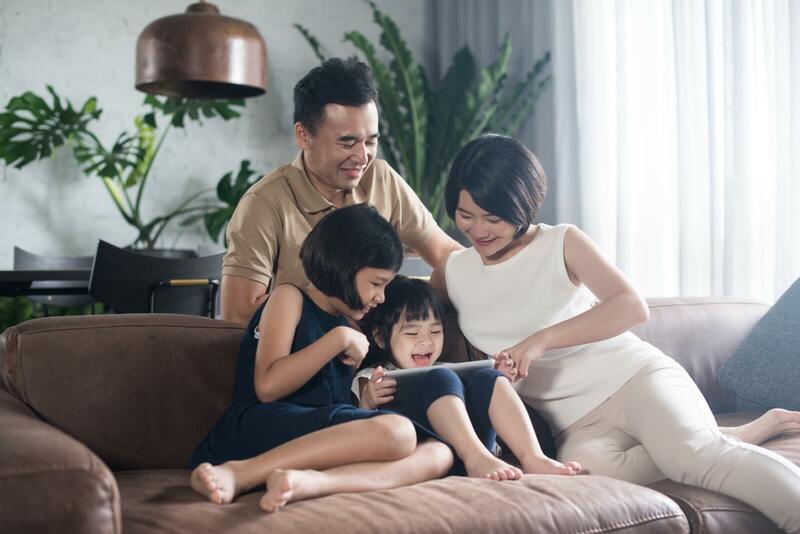 Find out how Dr Jiow Hee Jhee set media usage boundaries for his children. We have created these resources for busy parents who are keen to find more about parenting in this digital age. Feel free to download, print and share the information you find here. Parents play a pivotal role in their children's digital well-being. Aimed at empowering fathers to raise children that are safe,smart and kind digital citizens, this resource features handy and practical tips such as the easily implementable '5 Digital Rules for Our Homes'. Download a copy of the Dad's MediaTech Resource Kit. 2. What is the right age to give my child a smartphone? Giving your child a smart phone is a major parenting milestone for many. Read on to find out information about when is the right time to give your child a smart phone. This handy guide provides parents with tips to kick start your digital parenting journey. 4. Social Media Guide - What is the Right Age for My Child? The question of when to let your child use social media has been a hotly debated issue. This guide helps you answer this question by giving you the information and know-how you need. This guide curated specially for parents of preschoolers aims to answer some possible questions you might have with regards to your little one's usage of devices in their daily lives. Cyberbullying is the act of using the Internet or digital devices with the intent of hurting a person or group. 1. What are examples of cyberbullying? 3. My child is being cyber-bullied. What can I do? 4. The cyberbullying material is still online! 5. My child is a cyber-bully. What can I do? 2. Why does my child’s digital footprint matter? 3. What can my child do to leave better digital footprints? To leave less digital footprints, you and your family can use encrypted, privacy-friendly app alternatives such as Signal, Telegram, and Wire. However, remind them that this does not mean that they can say whatever they want online! 3. How can I teach my child to spot fake news? 1. What are examples of inappropriate content? 2. How can I stop my child from accessing inappropriate content? 3. My child has seen inappropriate content. What can I do? 4. My child is sharing inappropriate content. What can I do? 2. When might my child share personal information? 3. How can I help my child protect their personal information? 4. What happens if someone has my child’s personal information? As adults, we do not need someone to tell us how much time we should spend online or on our devices. But your child might need some guidelines. It is important stay aware of how much time your child is spending online, and the impact this has on both their school life – making sure that their grades are not suffering – and their social life – making sure that their relationships with friends and family are not impacted. If either of these areas are affected, then they probably need to cut back on how much time they spend online. This does not mean there are no benefits to having screen time. There are websites, games, and apps that can help your child gain literary skills, test their problem-solving skills, and more. However, they need to find a good balance between their online and offline lives and practice self-control. 3. What can I do to reduce my child’s screen time use?